A CLEAR majority of Hartlepool United fans say they would love to see former Welsh international Rob Earnshaw sign for the club, after an internet poll. It comes as Colin Cooper is looking to add experience to his squad ahead of the Sky Bet League Two campaign getting underway on August 9, away to Stevenage. Three former Premier League midfielders top Cooper’s wishlist, with Michael Brown, Jonathan Greening and David Prutton all heavily linked. But another name in the frame is Earnshaw, with the 33-year-old former Welsh international available on a free after leaving Blackpool, and he polled 45 per cent of votes in an online SportMail poll. * EARNSHAW: Polled 45 per cent of the vote. * BROWN: 22 per cent. * GREENING: 22 per cent. * PRUTTON: 11 per cent. 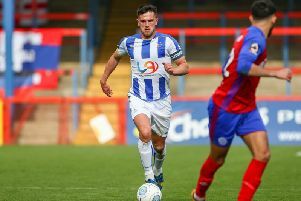 Cooper wasn’t confirming any names when SportMail put the four to him, but he did stress he is looking to add one or two more experienced players to the Pools squad. So far Pools have signed experienced defenders Matthew Bates and Stuart Parnaby following the release of Andy Monkhouse and Simon Walton, while James Poole and Antony Sweeney turned down new contract offers.